Home>Posts>GEnx-2B and CF34-10 FAA Certified! GEnx-2B and CF34-10 FAA Certified! GE Aviation Receives FAA Engine Certification on GEnx-2B and CF34-10A Engines. The U.S. Federal Aviation Administration (FAA) has issued type certificates for GE’s GEnx-2B and CF34-10A engines. The Part 33 certifications were issued today at the FAA’s office in Burlington, Massachusetts. EDC engineers have been heavily involved since the beginning on the design of those two engines. GEnx-2B. Boeing selected the GEnx-2B engine to power its 747-8 Intercontinental and 747-8 Freighter aircraft in 2005. The engine certification program started in 2008 when the GEnx-2B engine demonstrated 70,950 pounds (316 kN) of takeoff thrust during ground-testing at GE’s outdoor testing facility at Peebles, Ohio. Since that time, the GEnx-2B engine has completed ground-testing and three flight-testing sessions on GE’s 747 flying testbed in Victorville, California. The GEnx-2B engine has accumulated more than 2,600 hours of testing and more than 4,300 cycles on the ground and the flying testbed. The GEnx-2B engine began flight-testing on Boeing’s 747-8 Freighter in February and has performed flawlessly, accumulating a total of more than 2,100 flight-hours, more than 1,100 cycles and more than 3,800 run-hours (flight-hours and ground runs on the Boeing 747-8 aircraft). Entry into service is scheduled for later this year with Cargolux Airlines International S.A. of Luxembourg. More than 1,300 GEnx engines are on order to 48 customers around the world, including more than 400 GEnx-2B engines. Based on proven GE90 architecture, the GEnx engine will succeed GE’s CF6 engine. Compared to the CF6 engine, the GEnx will offer 15 percent improved fuel efficiency, which translates to 15 percent less carbon dioxide (CO2). The GEnx’s innovative twin-annular pre-swirl (TAPS) combustor will dramatically reduce nitrogen oxide (NOx) gases as much as 60 percent below today’s regulatory limits and other regulated gases as much as 90 percent. Based on the ratio of decibels to pounds of thrust, the GEnx will be the quietest engine GE has produced due to the large, more efficient fan blades that operate at slower tip speed, resulting in about 30 percent lower noise levels. 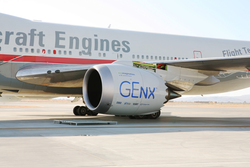 The GEnx is the world’s only jet engine with both a front fan case and fan blades made of carbon fiber composites. IHI Corporation of Japan, Avio SpA. of Italy, Volvo Aero of Sweden, MTU of Germany, TechSpace Aero of Belgium, Snecma (SAFRAN Group) of France and Samsung Techwin of Korea are revenue-sharing participants in the GEnx program. The GEnx is part of GE’s “ecomagination” product portfolio — GE’s commitment to develop new, cost-effective technologies that enhance customers’ environmental and operating performance. CF34-10A. The CF34-10A engine was selected to power the new ARJ21 regional jet from Commercial Aircraft Corporation of China (COMAC) in 2002. Based on the CF34-10E engine, the CF34-10A engine includes: a wide-chord fan for higher thrust and high tolerance to foreign object damage; 3-D aerodynamic design airfoils in the high-pressure compressor for highly efficient, stall-free operation, as well as better fuel burn and higher exhaust gas temperature margins; a highly durable single annular, low-emissions combustor that meets or surpasses the most stringent emissions standards; and a single-stage high-pressure turbine for lower operating cost. Certification testing on the CF34-10A engine started in 2007, and the engine demonstrated thrust capability up to 20,000 pounds. Flight tests on the ARJ21 continue with entry into service scheduled for 2011. COMAC has announced orders for 240 ARJ21 regional jet aircraft and sees a potential for up to 850 aircraft over the next 20 years. GE and COMAC have collaborated closely on the aircraft’s detailed design and the aircraft/engine integration. For the past two years, GE has been recognized as COMAC’s supplier of the year.